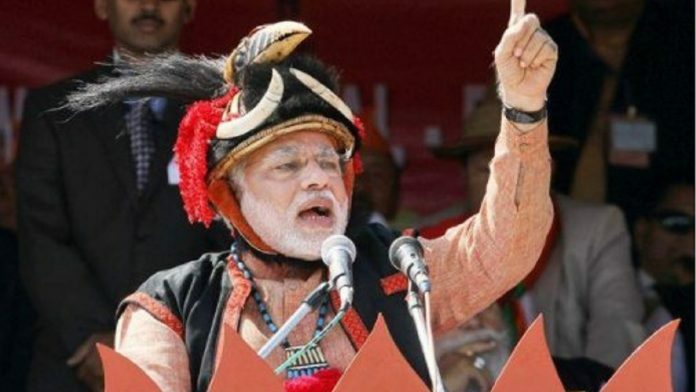 The Bharatiya Janata Party’s (BJP’s) electoral sweep of the northeast, especially its performance in Nagaland, has left political experts in the mainland puzzled. While columnists attribute the saffron party’s performance in Arunachal Pradesh and Assam to Hindutva politics, how does one make sense of its impressive tally in a state where over 90 per cent of the population is Christian? A common argument about the northeast, comprising eight states—Arunachal Pradesh, Assam, Manipur, Meghalaya, Mizoram, Nagaland, Sikkim, and Tripura—is that the performance of the party, which is in power in New Delhi, generally improves in these states. The graph above represents the vote share of the BJP in the northeast states in different election years. The X-axis shows the vote share, while Y-axis represents the state. It suggests that the BJP’s spectacular performance is hardly surprising. Even in the past, during the Atal Bihari Vajpayee-led first NDA government (blue colour bar), the BJP did perform well, but post-2014 Lok Sabha polls, the party has been nothing short of a hegemon in the northeast. The party has aimed to not just win seats but also form governments on its own in Arunachal Pradesh, Assam and Manipur—and is a part of the government in Meghalaya and Nagaland. This reflects a significant shift in the mindset of the people in this region, where the BJP—once just another political outfit—has become the key party to beat or vote for. Recent developments contradict the past analysis about the rise of the BJP in the northeast. The reason is neither Hindutva nor the region being ‘pliable’ to the Centre. The party’s success doesn’t just ride on the hope of change in young minds and/or the many Congress candidates who look for an opportunity to jump ship—and change the government. And no, the Narendra Modi-led BJP is not just depending on the popularity of the Prime Minister. It is focusing on service delivery—one of the reasons why the results of the 2019 polls in the northeast might bolster the national performance of the BJP and its allies. The Public Distribution System (PDS) has been in place for decades, but locals claim it has been just three years since Nagaland started getting rice under the welfare scheme. “Earlier we did not get such kind of provision, when Modi came in power then we have been getting Modi ka chawal,” said a member of the village development council in Tuensang district, whom I met during a field visit to Nagaland to observe the assembly election. Not just rice, households have also received toilet-building material under the Swachh Bharat Abhiyan, a flagship scheme of the Modi government. It is evident that voters, especially the youth, are frustrated amid the lack of development in the region and are looking for a fresh alternative. Many young voters who were thinking of supporting the BJP told me that they wanted ‘change’ in the state. “Look at our roads, it is so pathetic, there are no jobs, therefore we need to change the government. Modi is good for development and if BJP won here then we would get more funds for development, I am thinking of supporting him,” said a recent graduate working at a hotel in Mokokchung district. A 28-year-old from Kiphire district, who works at the Common Service Centre run by the government, said he, along with a few friends, had decided to mobilise youth for ‘change’ during the state polls: “We were not working for any party then but we campaigned village to village, to make people more aware about their rights… that we should just not be restricted in our thinking about religion and faith, we need to think about development. Also read: Will separate time zone for northeast increase efficiency or logistical chaos, alienation? He succeeded in the campaign—and the BJP won in one of the constituencies in Kiphire district. The young voters know that the BJP’s politics is not good for their faith as stories pour in about religious turmoil in the rest of the country, but they ask: Who represents us in the assembly? Only people from our community—and how would they change our tradition and food habits? That’s how the BJP—once a marginal player—turned into an acceptable party of representation. The author is an independent researcher and election analyst. He has worked with Ashoka University, CPR and Lokniti, CSDS.